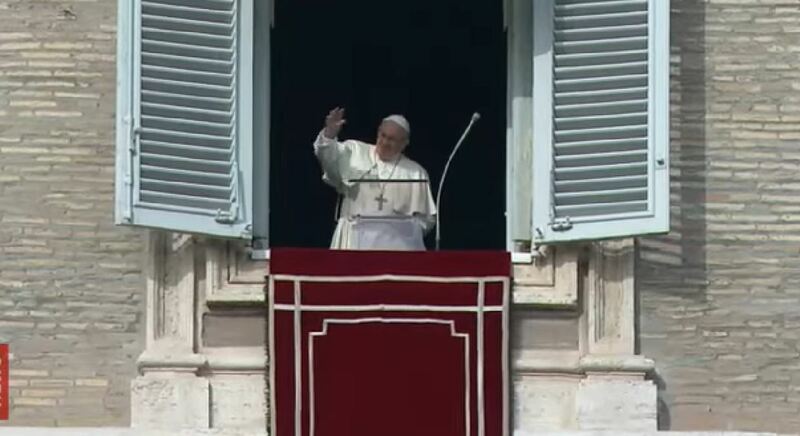 Here is a ZENIT translation of the address Pope Francis gave December 2, 2018, before and after praying the midday Angelus with those gathered in St. Peter’s Square. Advent begins today, the liturgical season that prepares us for Christmas, inviting us to raise our eyes and to open our heart to welcome Jesus. During Advent we not only wait for Christmas, we are invited to reawaken the expectation of Christ’s glorious return — when He will return at the end of time –preparing ourselves for the final encounter with Him with consistent and courageous choices. We recall Christmas; we wait for Christ’s glorious return, and also for our personal encounter — the day in which the Lord will call us. During these four weeks we are called to come out of a resigned and habitual way of living, and to come out nourishing hope, nourishing <our> dreams for a new future. This Sunday’s Gospel (Cf. Luke 21:25-28.34-36) points in fact in this direction and puts us on guard against letting ourselves be oppressed by an egocentric lifestyle or by the convulsive rhythm of the days. Jesus’ words resound in a particularly incisive way: “Take heed to yourselves lest your hearts be weighed down with dissipation and drunkenness and cares of this life, and that day come upon you suddenly like a snare. [. . . }”But watch at all times, praying” (vv. 34.36). Keep watch and pray: see how this time must be lived from today until Christmas. Watch and pray. The inner sleep stems from turning always around ourselves and remaining blocked in the closure of our life with its problems, its joys, and its sorrows, but always turning around ourselves. And this is tiring, this is boring, this closes us to hope. Here we find the root of the torpor and laziness of which the Gospel speaks. Advent invites us to a commitment of vigilance, looking outside of ourselves, widening our mind and heart to open ourselves to the needs of people, of brothers, and to the desire of a new world. It’s the desire of so many peopled, martyred by hunger, injustice <and> war. It’s the desire of the poor, of the weak, of the abandoned. This time is opportune to open our heart, to ask ourselves concrete questions on how and for whom we spend our life. The second attitude to live the time of waiting for the Lord is that of prayer. “Look up and raise your heads, because your redemption is drawing near” (v. 28), admonishes Luke’s Gospel. It’s about rising and praying, turning our thoughts and heart to Jesus who is about to come. We rise when we expect something or someone. We await Jesus; we want to wait for Him in prayer, which is closely linked to vigilance. However, if we think of Christmas in an atmosphere of consumerism, of seeing what I can buy to do this or that, of worldly celebration, Jesus will pass by and we won’t meet Him. We await Jesus and we want to wait for Him in prayer, which is closely linked to vigilance. But what is the horizon of our prayerful waiting? It is indicated to us in the Bible especially by the voices of the prophets. Today it’s that of Jeremiah, who speaks harshly to the people, tried by exile and who risk losing their identity. We Christians, who are also People of God, risk becoming worldly and losing our identity, rather, of “paganizing” the Christian style. Therefore, we are in need of the Word of God who, through the prophet, announces to us: “Behold the days are coming . . . when I will fulfill the promises I made [. . . ]. I will cause a righteous Branch to spring forth for David; and He shall execute justice and righteousness in the land” (33:14-15). And that righteous Branch is Jesus, it is Jesus who comes and whom we await. May the Virgin Mary, woman of waiting and prayer who brings us, Jesus, help us to reinforce our hope in the promises of Her Son Jesus, to make us experience that, through the anguish of history, God always remains faithful and also makes use of human errors to manifest His mercy. May this flame of hope and many little flames of hope, dispel the darkness of the war! Let us pray and help Christians to remain in Syria and in the Middle East as witnesses of mercy, of forgiveness and of reconciliation. May the flame of hope also reach all those who endure conflicts and tensions these days in other different parts of the world, close and distant. May the prayer of the Church help them to feel the closeness of the faithful God, and touch every conscience for a sincere commitment in favor of peace. And may God, our Lord, forgive those that make war, those that make arms to destroy one another and convert their heart. Let us pray for peace in beloved Syria. My greeting goes to you, Romans and pilgrims present here, in particular, those from Linden in the United States of America; Valencia and Pamplona <in Spain> as well as the students and professors of Madrid’s “Claret” College. I greet the polyphonic choir of Modica; the faithful of Altamura, Conversano and Laterza. I wish you all a happy Sunday and a good Advent journey. Please, don’t forget to pray for me. Enjoy your lunch and goodbye!